In Experiment 3, you journeyed into the fun world of input by reading data from an analog sensor. This experiment continues that journey, moving now into digital input. You'll learn how digital input differs from analog input, and you'll meet a useful new component: the push button (also sometimes called a momentary switch). You'll learn how to control a single LED with button presses, and then how to control multiple LEDs from multiple buttons. A momentary push button is a kind of switch, closing (completing) a circuit while it is being actively pressed. If you take a push button and look at it, you'll notice it has four pins, which might seem like a lot of pins. Let's walk through how the pins are connected to each other. The four pins on a push button are split into two pairs. Each pin is adjacent to two other pins: the other half of its pair (on the opposite side of the button) and a pin not paired with it (located on the same side). A pin is always electrically connected to the other pin in its pair, but is only connected to the other adjacent pin when the button is actively being pressed. When you press down on the button and get a nice "click," the button bridges the two sets of pins and allows current to flow through the circuit. Note: Not all buttons share this pin format. Please refer to the datasheet of your specific button to determine which pins are paired up. All right, now we have a sense of how a button can complete a circuit, but we need the right kind of circuit for our button. Button presses need to cause a digital input on the Tessel to move between HIGH and LOW logic levels when the button is pressed. The circuits in the two wiring diagrams for this experiment use a 10kΩ pull-down resistor with the buttons to make sure that the Tessel will read the button circuit as LOW (off/false) when the button isn't pressed and HIGH (on/true) when it is. Your kit comes with four different colored push buttons. All push buttons behave the same, so go ahead and use your favorite color! Connect the pushbutton to the breadboard. It should only fit in one orientation spanning the center notch. Use jumper wires to connect one of the right-hand pins of the button to the ground power rail, through a 10kΩ resistor, as shown. Connect the other pin of the right side of the button to the supply power rail with another jumper wire. Starting from a socket on the same row as the 10kΩ resistor — but on the opposite side of it from the button — connect a jumper wire to the Tessel's Port A, Pin 2. Plug the LED into the breadboard as shown, making sure the anode (longer leg) is closer to the top of the breadboard. Connect the cathode (shorter leg) to the ground power rail using a jumper wire. 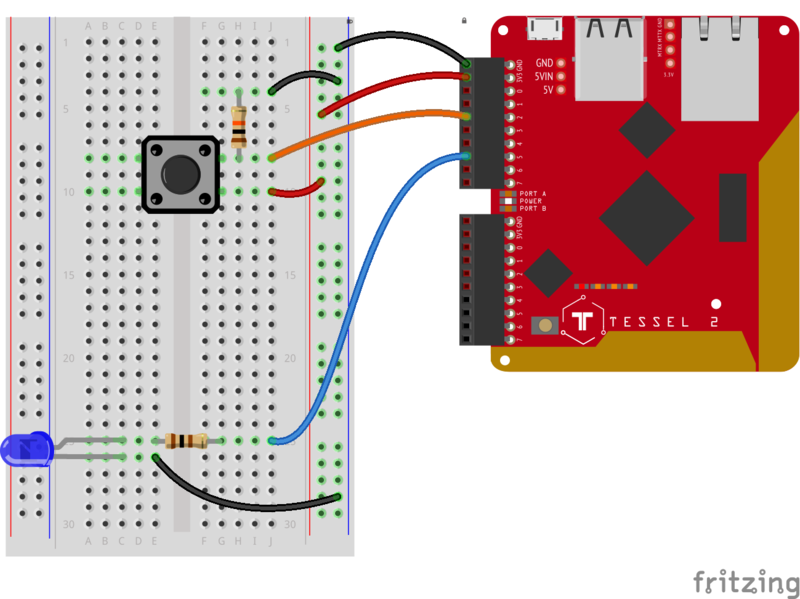 Connect the anode, through a 100Ω resistor, to the Tessel 2's Port A, Pin 5. 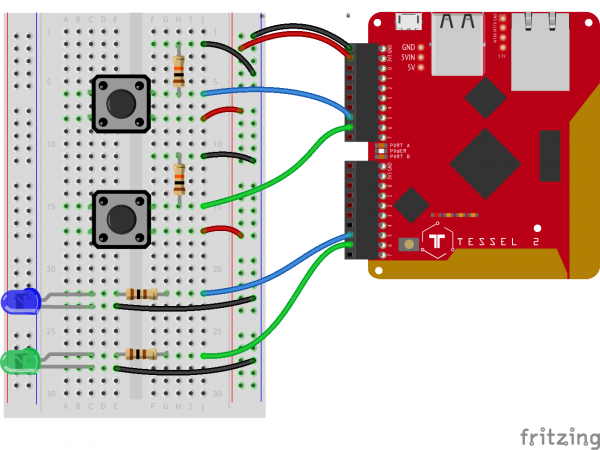 Connect the Tessel's +3.3V and GND pins to the breadboard's power rails, using jumper wires. The --single flag tells the T2 CLI to only deploy the single, specified file. This will preserve all other existing code on the Tessel 2 while still deploying your new program changes, which can make the deployment faster. When you press the button, the LED should light up. When you release the button, the LED should turn off. The Johnny-Five Button class takes care of processing values from input in order to emit intuitive events for each state of the hardware. We've registered handlers for these events: press, hold and release. Note: The minimum version of Node.js that runs on Tessel 2 supports many ES2015 features, including Arrow Functions, so we're using those here to simplify the program. When the button is pressed, the LED turns on. If the button is held (longer than half a second), the button will start blinking. When the button is released, the LED will turn off. This variation adds a handler for the Button object instance's hold event. In Experiment 2, you saw how Johnny-Five's Leds class could be used to manage a collection of Led objects. Similarly, the Buttons class can be used to control multiple Button instances. Buttons and Leds are both "Collections" classes. Instances of these Collections classes are Array-like objects that take care of instantiating the individual objects (Button, Led, e.g.) in their collection on your behalf. This would create an instance of the Leds class containing three Led instances, which each represent a single LED connected to a Tessel 2. These Collections classes do the busywork so you don't have to. The next few examples will use Collections classes to manage multiple inputs and outputs. The --single flag tells the T2 CLI to only deploy the single, specified file. This will preserve the existing code on the Tessel 2 while still deploying your new program changes, which can make the deployment faster. Pressing the first button should cause the first LED to light up. Pressing the second button should cause the second button to light up. Either LED will stay lit until the other button is pressed. We've mentioned this before — Collections classes act like Arrays, so much so that they are referred to as "array-like" (seriously! That's a technical term nowadays). Some of the ways they act like Arrays: they have a length property, and you can access their constituent objects using numeric indices. We saw this in Experiment 2. That means that the first Button object can be accessed as buttons and the second as buttons. Ditto for leds and leds for the Led objects. But we want to dynamically determine which LED to turn on. If the first button is pressed (buttons), we should turn on the first LED (leds). That means we need to know the index (0 or 1) of the button that is being pressed so we can turn on the corresponding LED. Create a game where an LED is lit after some random amount of time, and the player must turn it off before x amount of time has passed. The amount x may get shorter as the player progresses.